ABUJA, Nigeria, Aug. 16, 2018 /PRNewswire/ — A ten-member delegation including NetDragon Websoft Inc. (NetDragon)’s management team led by founder and chairman Liu Dejian, product designers and technical engineers, visited Nigeria and Kenya from August 13 to August 18, 2018. The delegation hosted several events during which they investigated the local education environment and provided exchange opportunities for local educators in a move to leverage NetDragon’s cutting-edge internet technologies to support the development of a smart education industry & ecosystem in the two countries. 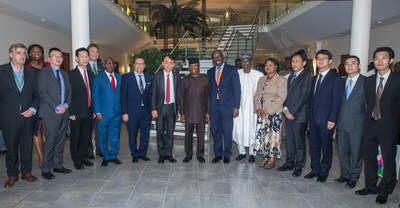 The events were attended by Nigerian Vice President Yemi Osinbajo, Minister of State for Education Anthony Gozie Onwuka and Minister of Communications Abdur-Raheem Adebayo Shittu, as well as Cabinet Secretary for the Ministry of ICT of Kenya, Joe Wakaba Mucheru and Cabinet Secretary for the Ministry of Education Amina Chawahir Mohamed, in addition to NetDragon Vice Chairman and Executive Director Dr. Leung Lim Kin Simon, Executive Director Zheng Hui, and Chief Executive Officer Dr. Xiong Li. During the visit, Chairman Liu was named as Nigerian SDGs (Sustainable Development Goals) Ambassador , NetDragon and the Nigerian government jointly launched the Initiative of Digital Education in Africa (IDEA). Prior to the company’s Nigerian visit, senior government officials from Nigeria had been to China. During the tour, officials signed a Memorandum of Understanding (MoU) with NetDragon, following their introduction and demonstration of educational products and solutions developed by their education subsidiary, Elernity. Details of the MoU included solutions to provide core elements of digital education combining VR, AR, and AI technologies. As a result, both parties are now taking action to implement the MoU, just four months after its signing; with the announcement of the partnership with the joint introduction of IDEA with the Nigerian government signifies the major first step. As a key part of IDEA, NetDragon will build a national public service platform of educational resources, a national network platform for the teaching community, a national digital talent training platform and a national future education experience center, all aimed at helping Nigeria create a high-quality education service system. The efforts will focus on primary, lifelong and future education. In addition to supporting Nigeria’s education service system , NetDragon also signed a collaborative agreement with the Nigerian government to build smart classrooms, preceded by the opening ceremony of the N-Power Junior Smart Classroom Project held in Nigeria on August 14. As part of its efforts in providing Nigeria with access to its education platforms and resources as well as one of its key products, Edmodo, NetDragon plans to make a donation to the smart classroom building project in Nigeria’s capital Abuja. The N-Power Junior Smart Classroom Project, managed by Nigeria’s National Social Investment Office, is committed to improving local primary and secondary school students’ scientific knowledge and skills in the disciplines of programming, computer graphics and computer-aided design, applications in robotics as well as network and fundamental engineering. The smart classroom donated by NetDragon is to be equipped with Promethean’s interactive displays, 101 PADs and VR headsets, and other components of an integrated intelligent classroom solution. Following the visit to Nigeria, the delegation arrived at the second stop of their African tour, Kenya, where the company will sign an MoU with the Kenyan government to engage in a collaborative effort to improve the country’s educational system. The MoU marks a milestone in NetDragon’s expansion into the African education market.